Today was a Regensburg kind of day! Regensburg is a city in Bavaria, Germany, located at the confluence of the Danube and Regen rivers, at one of the northernmost points of the Danube. To the east lies the Bavarian Forest. 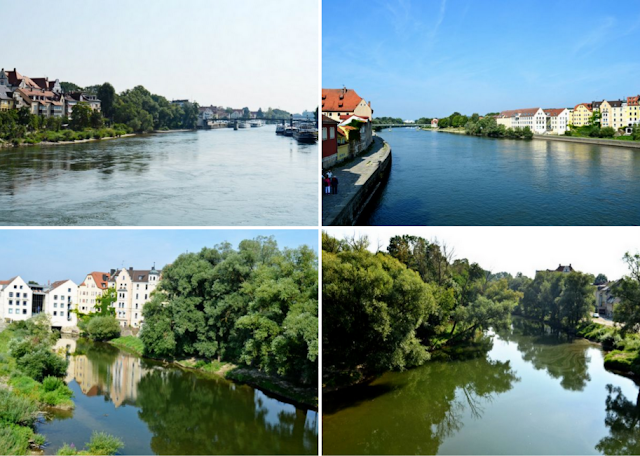 Regensburg is the capital of the Bavarian administrative region Upper Palatinate. The large medieval centre of the city is a UNESCO World Heritage Site. We went under this cool tower with a tunnel to get into the city. We found a parking garage and Fox was a happy boy because he got to press the elevator button. I'm glad he's so enthusiastic about the small things in life. We started making our way towards the iconic St. Peter's Cathedral and stopped to enjoy the scenery and architecture along the way. 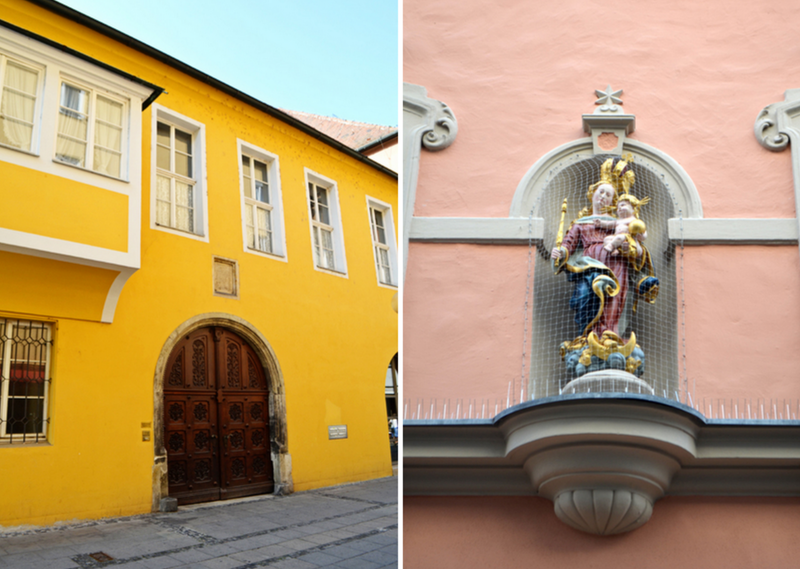 Mustard yellow building | Madonna and Child statue Reminds me of Leavenworth. 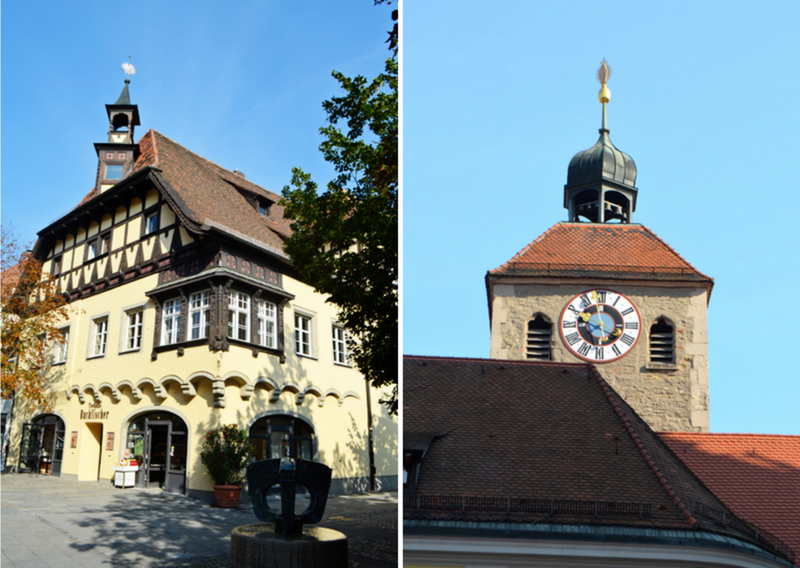 Or does Leavenworth remind me of Germany? St. Peter's Cathedral! 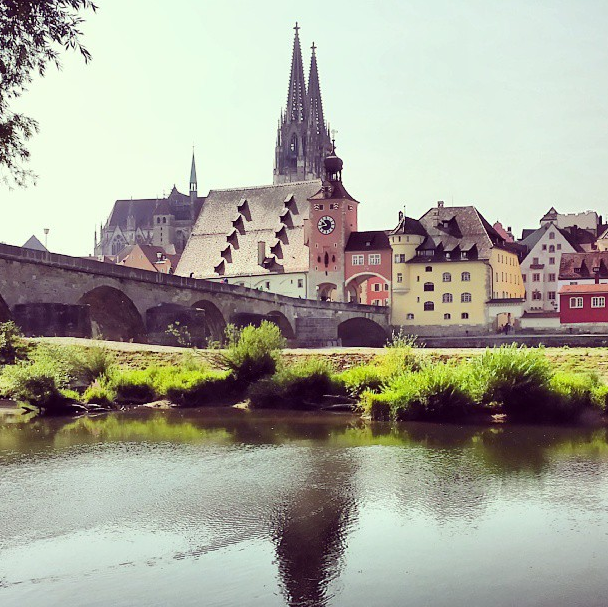 This cathedral is considered the most significant Gothic work in southern Germany and the most important church and landmark of the city of Regensburg - pretty impressive! 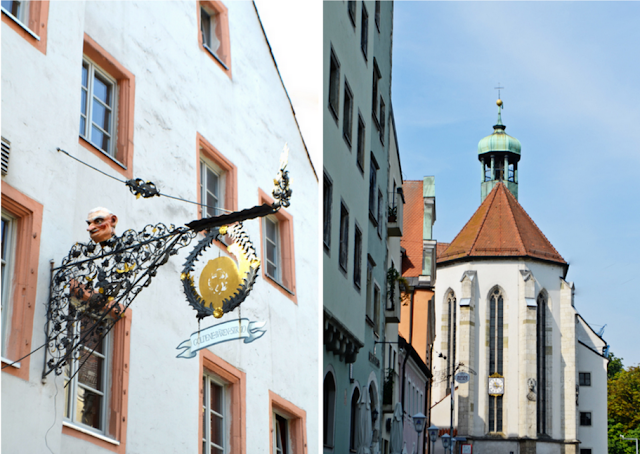 Dedicated to St. Peter, this cathedral it is the seat of the Catholic diocese of Regensburg. The church is the prime example of Gothic architecture in Bavaria. Chris and Fox | Paige and Jane (who I decided looks NOTHING like me!) sitting on the steps of the cathedral. 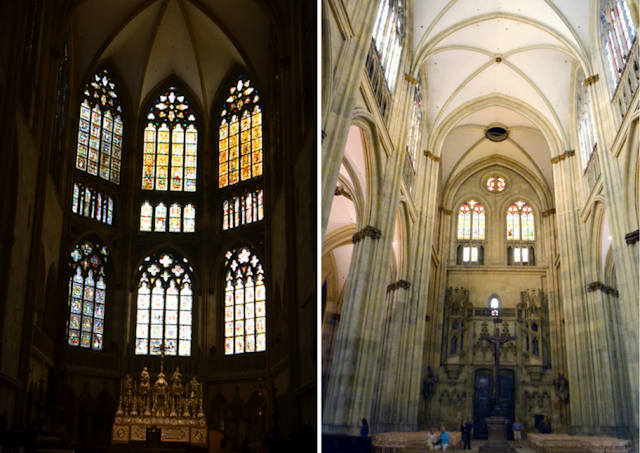 We went inside - I always feel so small and insignificant inside cathedrals because they are SO TALL. We admired the stained glass windows. Most of the valuable stained glass windows were installed between 1220-1230 and 1320-1370. The windows of the west facade were only completed in the 19th century. On the side of the cathedral are sun dials | Mint green building with a pretty statue fountain in front. Walking along the streets and taking in the pretty sights and flowers. Next we walked across the old Stone Bridge. It goes over the Danube river which is also the river that goes through Budapest. Fox threw a stick in the river and we told him to look for it next week when we're in Budapest! Wow could this BE any prettier?!? I mean, really. A picture is definitely worth a thousand words here! Chilling on the banks of the Danube. 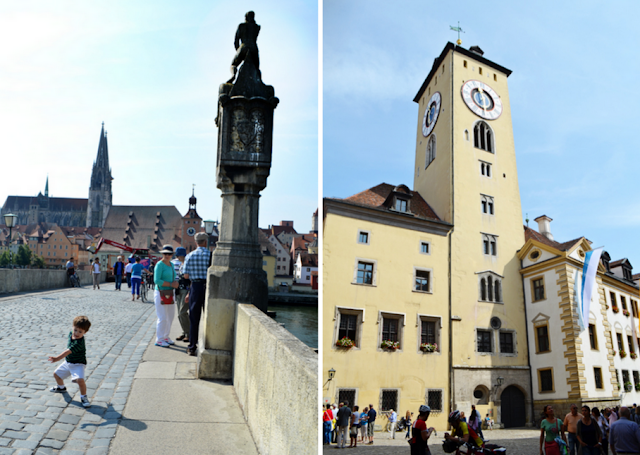 Walking back over the bridge into Regensburg and checking out the Danube River boat cruises. There are gelato stores on every corner. We finally gave in to Fox's pleas and got him a scoop. He devoured it within one block, silly boy. We didn't have a guide or places to go in mind, so we just strolled around. Moseyed, if you will. Thon-Dittmer Palace. 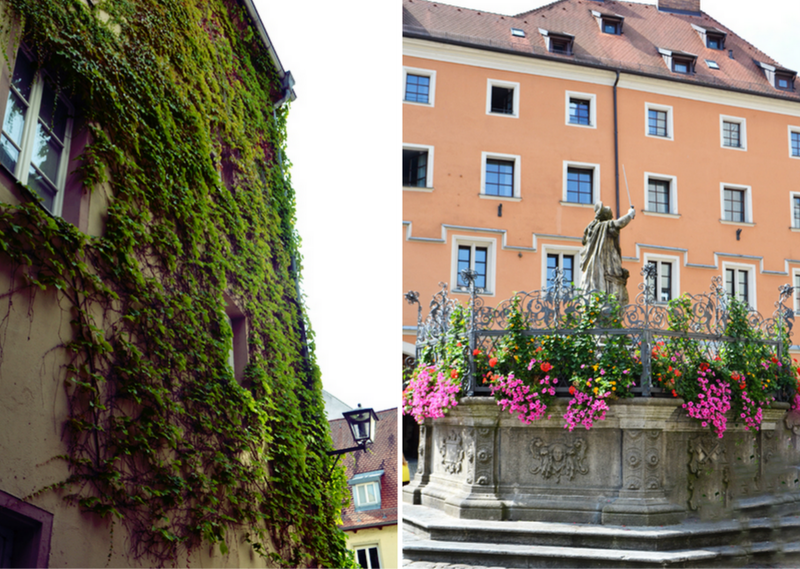 Located on the north side of the Haidplatz square, this elegant building adds a touch of courtly elegance and sophistication to Regensburg's predominantly medieval backdrop. The stylish, modern rooms are ideal for conferences or private gatherings. A stage inside the Thon-Dittmer Palace. Fun views of the city. Of course we had to eat some bratwurst! I got adventurous and tried currywurst - sooooooo good. 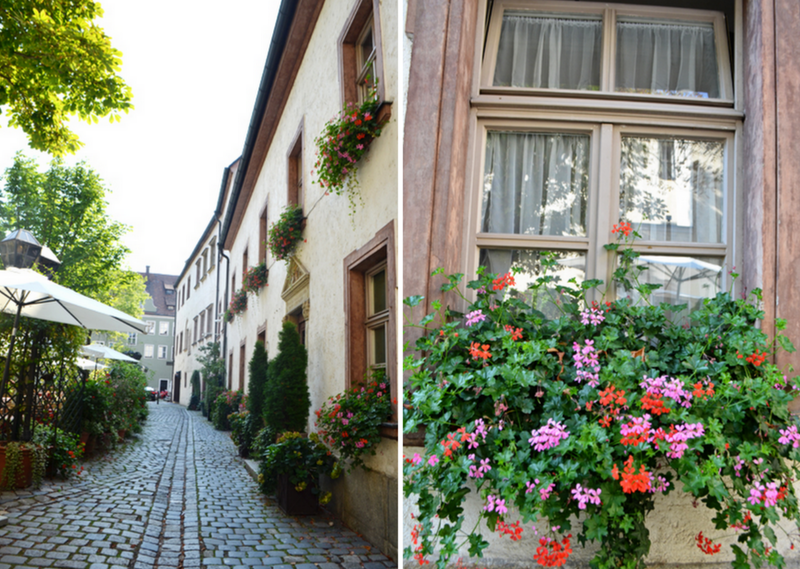 Then we walked back to the car and drove to the Thurn and Taxis Palace. The Princely House of Thurn and Taxis is a German family that was a key player in the postal services in Europe in the 16th century and is well known as owners of breweries and builders of many castles. We went inside the basilica. We got lost and couldn't really tell where the actual palace was and Fox and Jane were done for the day so we called it good and drove home. 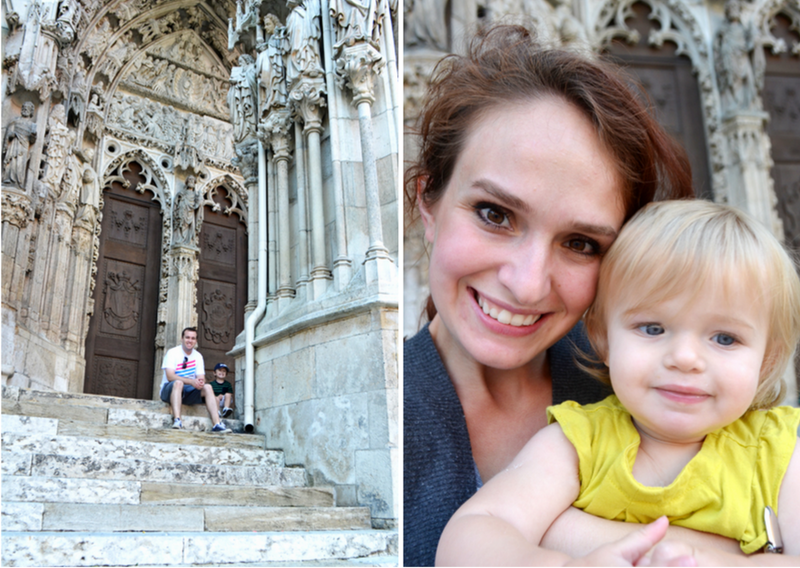 Our next big adventure is to Budapest! Just gorgeous!!! 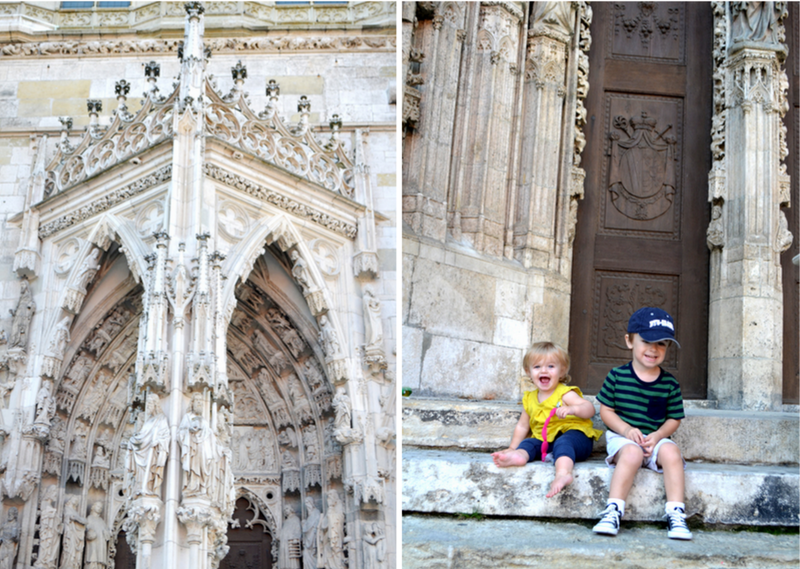 Oh to go inside the cathedrals and churches... they are so pretty!! The scenery... AMAZING! 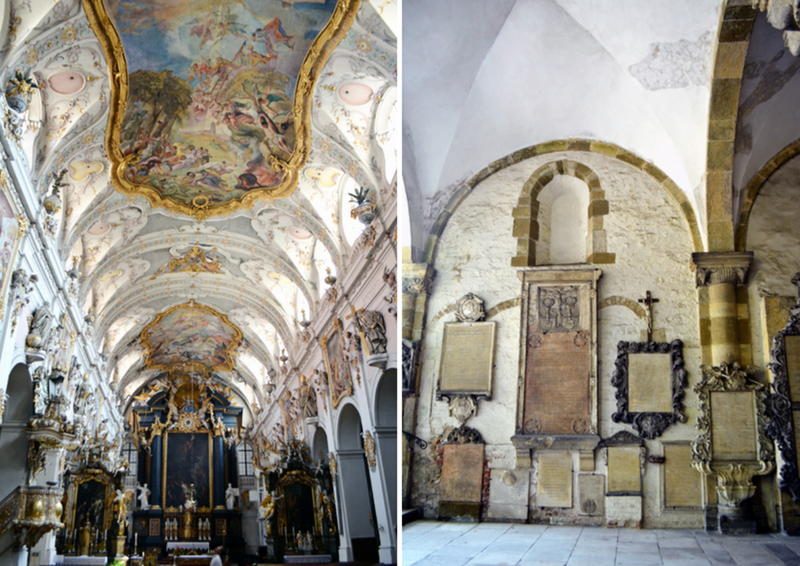 Gorgeous photos ... that church is just amazing!! Love seeing these photos, Paige! And I had the same thought as Julie...that church is amazing! Wow...you are giving me wanderlust! It's so nice that you are taking advantage of living overseas and getting to see the sights! 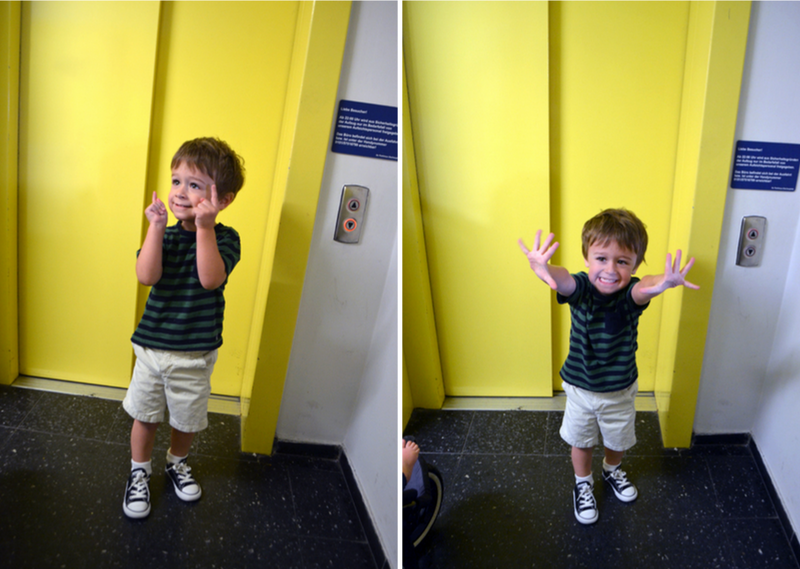 Your kids are little troopers! All pics are really awesome!!! 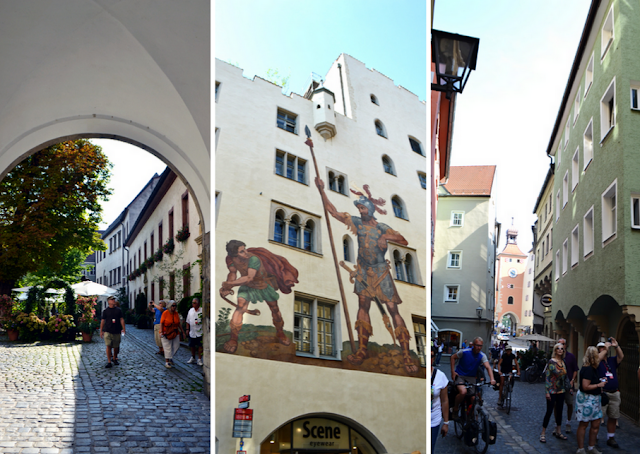 It is always a hard task to travel with kids but I think Regensburg is a best city for that. A well developed city with all required facilities. There are various tourist attractions to visit and Regensburg festivals and events are also so enjoyable. 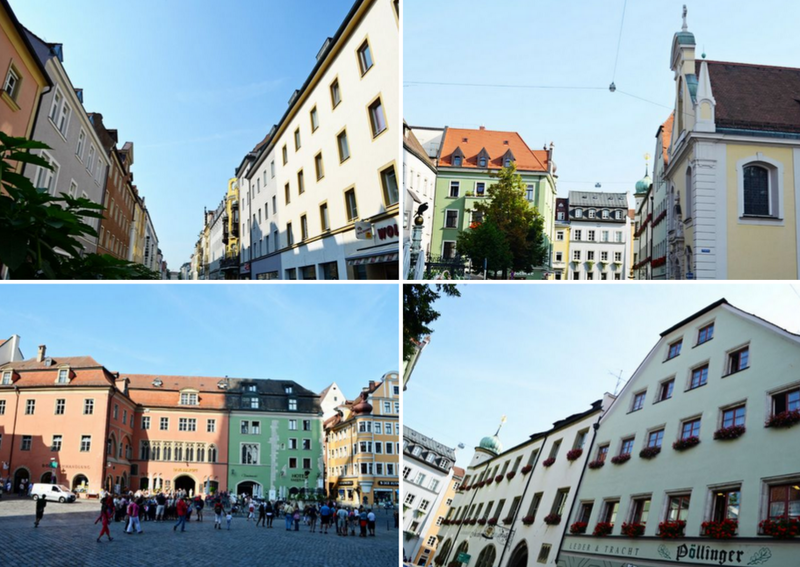 It is a best to get up close with Bavarian culture. SO GORGEOUS!! 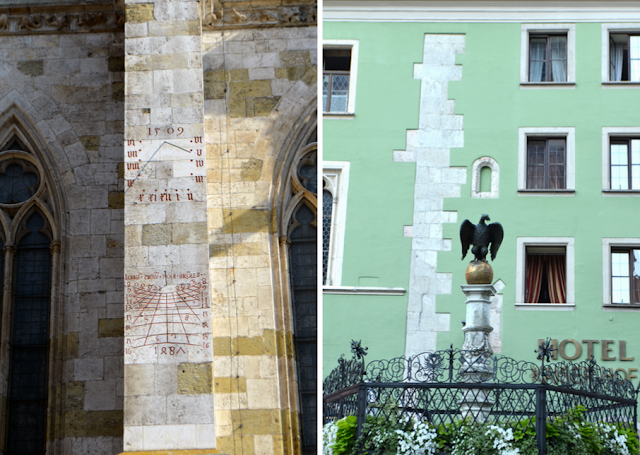 I can never believe the detailing on cathedrals. Unbelievable how much work went into those!! You're making me wish I had bought a year's vacation in Europe instead of a new house! Beautiful photos - what great adventures you're all having! EYE candy--seriously AWESOME texture and colors!